As a travel couple, we are always looking for a romantic getaway. Whether it is to a new country or just outside our backyard, there is always a romantic getaway waiting for us. Our latest romantic endeavor was only three hours away to the Farmhouse at Veritas located in Virginia’s wine country on the Monticello wine trail. We have stayed at some of the best resorts in the world, so when we say that the Farmhouse at Veritas blew us away, we mean they BLEW US AWAY! This bed and breakfast has exceptional service, world class cuisine, amazing house wines, spectacular views, cozy accommodations and more. The Farmhouse at Veritas is truly the perfect romantic getaway that every couple (above 21 years old) should experience. Full disclaimer – We were invited by The Farmhouse at Veritas to enjoy their accommodation and dinner. As always, our opinions are non-biased and our own. We want to thank the Farmhouse at Veritas for their generosity. 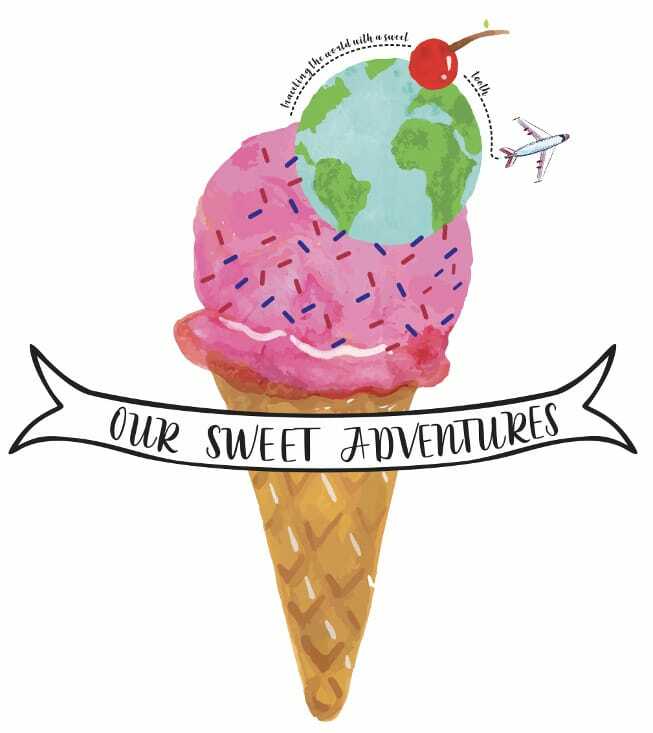 In addition, we want to thank everyone for following and supporting us on all of Our Sweet Adventures. The Farmhouse at Veritas was first built back in July of 1839. It was a family home for almost 200 years, including the family owners of Veritas, Andrew and Patricia Hodson. They lived in the farmhouse when they planted their first 5 acres of grapes in 1999. Since then, they have grown Veritas into one of Virginia’s leading wineries with over 250 acres of vineyards, a tasting room, and a special event space. In addition, they turned their home at the Farmhouse into a bed and breakfast in 2012. Today, the Farmhouse at Veritas is a member of the BedandBreakfast.com Diamond Collection that whisks guest’s off their feet. The Farmhouse at Veritas is the most beautiful bed and breakfast imaginable. It is a two story house surrounded by the spectacular Blue Ridge Mountains and Veritas vineyards. It has THREE different porches wrapped around the house, a beautiful kitchen, gathering room, living room, foyer, dining room, library and a cute garden house. There are also six guest rooms for guests. Needless to say, the Farmhouse at Veritas has plenty of room to accommodate plenty of guests. We loved each room because it gave us the opportunity to not only enjoy the ambience of the house, but also the company of other guests. With that said, playing billiards in the gathering room is a very easy way to leave the Farmhouse at Veritas with new friends. One of our favorite areas of the house was the second floor porch. The porch faces the Blue Ridge Mountains and is the perfect place to enjoy a glass of wine with your loved one. The Farmhouse at Veritas team makes you feel at home away from home. There is one person to check you in, provide a tour of the house to help you get acquainted, provide wine and snacks, and serve the dinner. This service felt intimate and personal which we really appreciated. We had the pleasure of being accompanied by Anjel. He was absolutely outstanding. If we needed anything, no matter how small, Anjel was always happy to assist us. His exceptional service is what makes the Farmhouse at Veritas one of the best hotel experiences you will ever encounter. The exceptional service continues with Adam’s favorite amenity in the house, freshly baked cookies! Yes, guests of the Farmhouse at Veritas get to indulge in freshly baked cookies during check-in and throughout the evening until they are gone. We are not going to lie, Adam probably had at least six cookies. Who knew cookies paired so well with wine? Of course, the other fantastic amenity is the wine! Guests are served a selection of Veritas wine along with snacks for wine hour. This is when we fell in love with Veritas White Star and Veritas Club Cuvée. The wine didn’t stop there – Anjel also poured us some Veritas Champagne as a pre-dinner drink. These surprises and special touches are what defines the Farmhouse at Veritas the best bed and breakfast experience imaginable. As we briefly stated, the Farmhouse at Veritas has six rooms throughout the house. There are four upstairs and two downstairs. Each room is unique and decorated to reflect the 19th century. In addition, there is also a barn cottage with two bedrooms, which is perfect for a family or group of friends. We had the honor to stay in the Derby room, the only two story room in the house. When you see photos of the Derby, you will instantly fall in love with this room and book your reservations! The room has soft colors of pink, blue and green decorated with floral and bird art pieces that adds a lovely touch to the ambience of the room. However, the best part of this beautiful two story room, is the spiral staircase that leads to the bedroom. In addition to the amazing spiral staircase, the Derby also has other great features. There is a lovely desk with great views of the Blue Ridge Mountains. A spacious living room area equipped with a TV, couch and three sitting chairs. Furthermore, the Farmhouse at Veritas provides a complimentary bottle of Veritas wine with two signature glasses to take home. The bedroom is upstairs and only contains the comfortable bed with the cutest owl pillows. The bathroom has everything you need including toiletries, a spacious closet for clothes and bathrobes for guests use. The Farmhouse at Veritas also has a fine dining restaurant led by Chef Andy Shipman. Chef Andy has been with the Veritas team since 2010 and excels in farm-to-table dining experiences. He uses only the freshest ingredients available from the Farmhouse garden, as well as, local ingredients. Each week guests will find a new menu from the creative mind of Chef Andy, where you can expect to be taken on a delicious and refined culinary adventure. In-house guests of the Farmhouse at Veritas receive a complimentary breakfast. The breakfast is served between 9am to 11am at either the farm table, breakfast bar, dining room, or al fresco in the garden house. We could not think of a better way to start our day than with breakfast during a cool summer morning at the garden house. The Farmhouse at Veritas knocks both “bed” and “breakfast” out of the park! Breakfast at the Farmhouse is a wonderful experience. As soon as we were seated our server greeted us with coffee, water, orange juice and champagne! Honestly, each beverage sounded so good, we had it all! Then we were brought a freshly baked croissant with a home-made strawberry rhubarb nectarine jam and berries. It was the perfect start to our morning. For the main breakfast entree, guests have the option to choose between the savory and sweet daily dishes. Of course, we had to try them both. The savory dish was breakfast sausage with potato hash, asparagus, an over easy egg and tomato jam. It was by far the best over easy egg we have ever had. The egg had such a crunchy and crisp exterior with a perfect runny yolk. The sweet dish was French toast with caramel, cream cheese and white chocolate. This was surprisingly balanced with so many sweet components. It was a sweet perfection! Dinner at the Farmhouse is open to both in-house and outside guests from Tuesday through Saturday at 6:30pm. The Farmhouse dinner is composed of a four course menu with wine pairings from Veritas winery. Before dinner, you can engage with the chef as he prepares the dinners inside the kitchen at the Farmhouse. This was a great experience for us as we enjoy sharing our love of food to those in the profession. The first course served to us – smoked chicken confit with farro verde, peach salsa, corn molasses and gastrique. It was paired with Veritas Viognier 2017. This dish was beautifully presented with a refined modern touch. The smoked chicken confit was juicy and full of flavor – it practically melted in our mouths. The peach salsa added a refreshing touch and lightened the entire dish. For our second course we enjoyed the perfect summer salad – local corn and zucchini salad with Anaheim peppers, cornbread crumbs, tomato dust, buttermilk cheese, mache (corn lettuce) and tomato aioli. It was paired perfectly with a refreshing Veritas Rose 2017. We did not know what to expect from this dish since there were so many interesting components, but it surprisingly blew us away. Chef Andy and his team are flavor geniuses because the flavor combinations were incredible. Probably the best summer salad we have ever had. The third course served was – a 7 Hills strip steak with sweet potatoes, green beans and a spiced chicken jus. It was paired with Veritas Vintners Reserve 2015. You can never go wrong pairing a nice red wine with a juicy steak. The steaks were seasoned and cooked to perfection. The smashed sweet potatoes and green beans were a great hearty addition to the meaty steak. Alas, the fourth course aka, our favorite course, dessert – hibiscus sorbet with a lemon cremeux, cocoa nibs and strawberry gel. It was paired with the perfect wine, Veritas Kenmar 2013. As soon as we tasted the Veritas Kenmar 2013, we LOVED it! We quickly learned the reason why, it is ice wine. Veritas produces their own type of ice wine and it is the best wine on the Monticello wine trail. In addition, the dessert was killer! We could not have asked for a better finish to this incredible dinner. The hibiscus sorbet itself was refreshing, but paired with the creamy lemon cremeux was absolutely outstanding. As a pastry chef, Christina was blown away by this dessert. The cocoa nibs added a contrast of crunchy texture and a bittersweet finish to every bite. It was simply exquisite. A stay at the Farmhouse at Veritas is not complete without visiting the winery itself. The Veritas winery is hands down one of the best wineries in Northern Virginia. They have a grand tasting room with a lovely outdoor patio that faces the vineyard and Blue Ridge Mountains. It’s a wonderful view to enjoy while drinking your choice of Veritas wine. The wine tasting includes between 6-10 wines at a price of $10 per person. The wines vary from current releases to young, crisp white wines and aged, full-bodied reds. If guest’s start to grow an appetite with their wine, they can order from The Terrace for al fresco dining. Some menu options include: cheese board, charcuterie, hummus, salads and sandwiches. Guests can also enjoy a wine tour where you can learn and see (varies on time and day) the process of creating wine. In addition, you also get to see where Veritas keeps their wine barrels downstairs. It is an unique experience that should not be missed. Just note, wine tours must be reserved prior to your visit. Words will never be enough to express how much we loved our experience at the Farmhouse. We have been fortunate to travel to some of the most beautiful places in the world and have stayed at some of the best resorts in the world. So when we say that the Farmhouse at Veritas blew us away, we truly mean it. We had the best romantic getaway here and cannot wait to return. We highly recommend every couple experience the Farmhouse at Veritas to enjoy a weekend you will never forget. Oooh breakfast in the garden house would be a dream! Lovely place. This looks adorable and romantic. I love a Cozy getaway with my hubby. I may need to put this on the list. This sounds like such an amazing place with beautiful rooms, fantastic views, a 200-year history to learn about, and best of all, champagne for breakfast. Couldn’t get more perfect than that! And that food looks so tempting, it’s making me hungry. This sounds like such a wonderful place. Romantic stays with long histories behind them have always attracted me. And if you get that amazing food out there, nothing better. I could not just take my eyes off the food. That food looks delish. It’s a shame I don’t drink but I know a fair few people who would enjoy this. The farmhouse and dinner looks like a great reason to visit alone! Heh, that kinda looks like a luxury farm. I stayed on a farm once, but a regular one… in Norway, which is super beautiful. The house is so beautifully furnished – very nice. I can totally see how to spend a romantic weekend there – strolling through the vineyards (is it allowed?). Ending a day with this wonderful dinner makes it complete, I think. This looks like such a lovely experience! I like these farmhouse style hotels you have in the US, it’s so unique. The food looks incredible and as a wine person, I’d really enjoy trying what they have, especially the champagne! Great photos as per usual. My wife and I have an anniversary coming up and we have thought of spending it at a Winery or resort setting. I read your article and found it very inspiring. Thank you. Aww thank you so much for your kind words. Congratulations on your anniversary! You will have a very romantic time at the Farmhouse at Veritas. They do an amazing job – hospitality, wine, cuisine, landscape – you will love it! did you visit other wineries while you stayed here?